It started on a summer afternoon in 1795 when a young man named Daniel McGinnis found what appeared to be an old site on an island off the Acadian coast, a coastline fabled for the skullduggery of pirates. Ever since that summer day, the possibility of what might be hidden in the depths of a small island off the south coast of Nova Scotia, Canada, has made it the site of the world's longest, most expensive, and most perplexing treasure hunt. 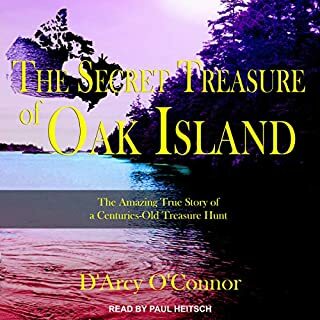 Author D'Arcy O'Connor recounts the fascinating stories and amazing discoveries of past and current treasure seekers who have sought Oak Island's fabled treasure for over 200 years. Great history of Oak Osland. Arguably one of the most provocative, puzzling, and misunderstood organizations of medieval times, the legendary Knights Templar have always been shrouded in a veil of mystery, while inspiring popular culture from Indiana Jones to Dan Brown. 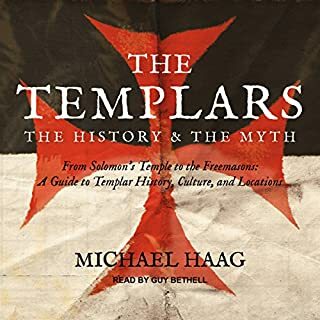 In The Templars, author Michael Haag offers a definitive history of these loyal Christian soldiers of the Crusades - sworn to defend the Holy Land and Jerusalem, but ultimately damned and destroyed by the Pope and his church. The narrator is great but the rest is a waste. David L. Mearns has discovered some of the world's most fascinating and elusive shipwrecks. The Shipwreck Hunter chronicles his most intriguing finds. 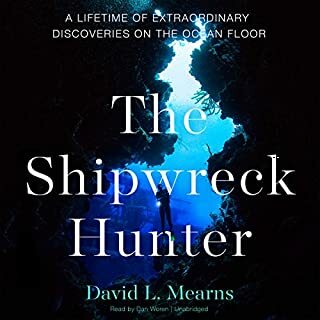 It describes the extraordinary techniques used, the detailed research, and mid-ocean stamina and courage required to find a wreck thousands of feet beneath the sea, plus the moving human stories that lie behind each of these oceanic tragedies. Combining the adventuring derring-do of Indiana Jones with the precision of a scientist, The Shipwreck Hunter opens an illuminating porthole into the shadowy depths of the ocean. Delivered More Than I Expected! 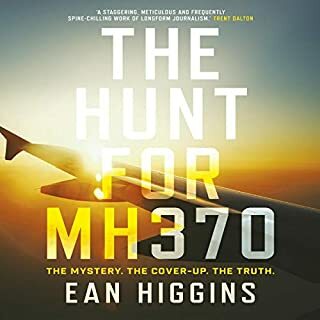 Somewhere deep beneath the wild seas of the southern Indian Ocean, perhaps in the eerie underwater canyons of Broken Ridge along the Seventh Arc satellite band, lies the answer to the world's greatest aviation mystery. Why, on the night of 8 March 2014, did Malaysia Airlines Flight MH370 suddenly U-turn, zig-zag up the Straits of Malacca, then vanish with 239 souls on board? Was it an elaborate murder-suicide by a rogue pilot? A terrible accident such as onboard fire, rapid decompression or systems failure? A terrorist hijacking gone wrong? Or something else entirely? The Oak Island Enigma is a gripping history of the mystery of Oak Island and its "Money Pit". It details the early discoveries: the shaft with its platforms, the drainage tunnels from the ocean that fill the shaft with sea water, the many attempts to find what the construction hides and protects. Berlin, 1942. The Gestapo arrest 18-year-old Bert Lewyn and his parents, sending the latter to their deaths and Bert to work in a factory making guns for the Nazi war effort. Miraculously tipped off the morning the Gestapo round up all the Jews who work in the factories, Bert goes underground. He finds shelter sometimes with compassionate civilians, sometimes with people who find his skills useful and sometimes in the cellars of bombed-out buildings. NOT YOUR USUAL STORY ABOUT THE NAZIS...FANTASTIC! A study of the substantial evidence for a former race of giants in North America and its 150-year suppression by the Smithsonian Institution. When Truman asked Stalin in 1945 whether Hitler was dead, Stalin replied bluntly, "No." As late as 1952, Eisenhower declared: "We have been unable to unearth one bit of tangible evidence of Hitler's death." What really happened? Simon Dunstan and Gerrard Williams have compiled extensive evidence - some recently declassified - that Hitler actually fled Berlin and took refuge in a remote Nazi enclave in Argentina. A thrilling, intellectual detective story that looks deep into the past to uncover who first settled the islands of the remote Pacific, where they came from, how they got there, and how we know. From longtime Rolling Stone contributing editor and journalist Randall Sullivan, The Curse of Oak Island explores the curious history of Oak Island and the generations of individuals who have tried and failed to unlock its secrets. In 1795, a teenager discovered a mysterious circular depression in the ground on Oak Island, in Nova Scotia, Canada, and ignited rumors of buried treasure. Early excavators uncovered a clay-lined shaft containing layers of soil interspersed with wooden platforms, but when they reached a depth of ninety feet, water poured into the shaft and made further digging impossible. Since then the mystery of Oak Island’s “Money Pit” has enthralled generations of treasure hunters, including a Boston insurance salesman whose obsession ruined him; young Franklin Delano Roosevelt; and film star Errol Flynn. Perplexing discoveries have ignited explorers’ imaginations: a flat stone inscribed in code; a flood tunnel draining from a man-made beach; a torn scrap of parchment; stone markers forming a huge cross. Swaths of the island were bulldozed looking for answers; excavation attempts have claimed two lives. Theories abound as to what’s hidden on Oak Island - pirates’ treasure, Marie Antoinette’s lost jewels, the Holy Grail, proof that Sir Francis Bacon was the true author of Shakespeare’s plays - yet to this day, the Money Pit remains an enigma. The Curse of Oak Island is a fascinating account of the strange, rich history of the island and the intrepid treasure hunters who have driven themselves to financial ruin, psychotic breakdowns, and even death in pursuit of answers. And as Michigan brothers Marty and Rick Lagina become the latest to attempt to solve the mystery, as documented on the History Channel’s television show The Curse of Oak Island, Sullivan takes listeners along to follow their quest firsthand. ©2018 Randall Sullivan (P)2019 Brilliance Publishing, Inc., all rights reserved. The amount of research that went into the writing of this book is astonishing--but not dry. The book becomes a living, breathing, ongoing tale of searches for treasure and solutions to mystery. Randall Sullivan writes frequently in the first person throughout this book to offer his own insight and observations--which kept me engaged and very interested. Those of us who are familiar with the TV show, The Curse of Oak Island, realize that the show gives us only the tip of the iceberg regarding the history of the search for Oak Island treasure. This book also goes into detail about the rivalry between Dan Blankenship and Fred Nolan--which is significant if we want to understand the animosity they held for each other most of their adult lives. The quality of the reader/narrator can't be understated. A bad narrator can ruin a great book. A great narrator can make a great book even greater. 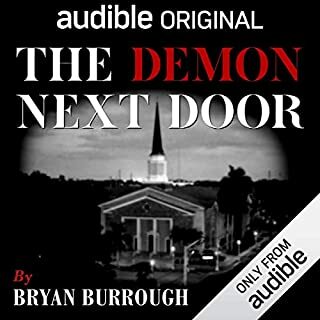 Brandon Wright does a fantastic job as narrator of this book. I really liked this book and story. There was plenty of information giving that I didn't know about. I would recommend this book to all. 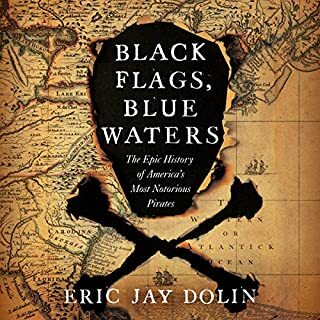 If you can't get enough of the History Channels "The Curse of Oak Island" or you simply want to know more about the island itself, then this book is a must! Braden Wright does an excellent job narrating the book, and that's something coming from me. He isn't dull or boring and truly sounds as if he's actually enjoying the book himself. Right off the bat, you can tell Randall has a serious interest in the island and whether he wants to admit it or not, he has been hooked by the mystery since day one. Yet, unlike most, Randall takes a very senseable and reasonable look at the island through the eyes of history and does an outstanding job investigating the many theories that have popped up over the centuries. I highly recommend this book for any Oak Island lover or anyone interested in lost treasure. My only wish is that there could be other books like this, which focus on different lost treasures from around the world! I “read” the audio book on a long two day drive. Although the the book was quite long and a bit boring during some of the theory descriptions, I found it very informative and it made the tv series much more interesting. The Nolan Blankenship conflict was explained evenhandedly and all the TV characters were given much more depth. The most notable benefit of the read was understanding all the prior efforts to unearth whatever lies underground and the extent of the drilling and excavations that have accumulated over the years. Anyone with at least a moderate interest in Oak Island should find this read rewarding. I enjoyed this book. How interesting and well thought out this book was written and narrated. I could put it down. Thank you. 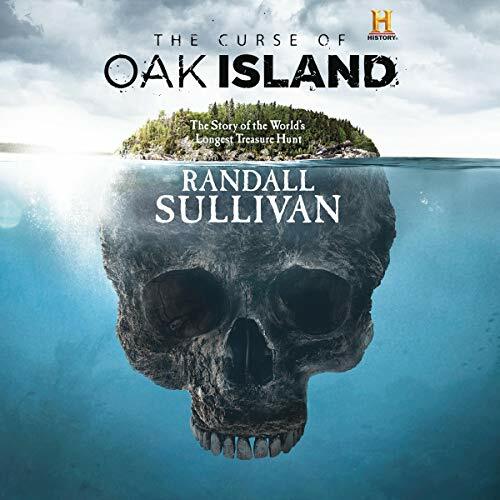 I am a big fan of the show and have had an interest in the Oak Island mystery since childhood - I would say this book by Mr Sullivan is the most comprehensive of any that I have read on the subject. I really appreciated how even handed the author was in examining such a wide range of theories and ideas. In many ways his pragmatic approach debunked a number of the more fringe theories, yet throughout the book he concedes that many remain as potentially viable answers. The destruction of the original money pit area while in pursuit of the treasure may ultimately prevent finding out a definitive answer. I was very surprised at how many tunnels and shafts were attempted in the over 200 year pursuit. Was there ever a treasure, what was the treasure, is it still there and who actually was responsible for the original work - all questions that may never be answered. The content was fascinating, the narration was exceptional. Well worth the credit. I thoroughly enjoyed the book just like I enjoy watching the show. Very interesting to hear all of the information, theories, and history. Excellent Story, goes into detail of the theories of what’s believed to be buried on the island. I’m a huge fan of the show. I could never see part the numbers. So much info about years, distance and depth. I mistake it for a novel / fact book. I wanted more. Not my cup of tea, I want to be wowed, not bored.